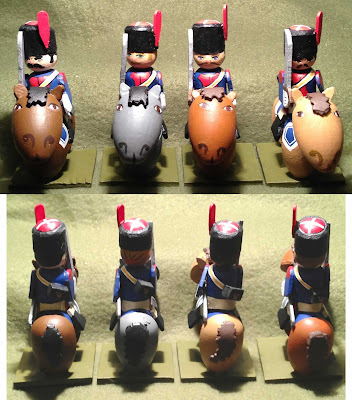 A blog about designing, creating, and painting wooden model soldiers for wargaming. These models are sometimes known as "craftees". To me, they are wooden warriors. This is why I paint Napoleonics. It is because of uniforms like this. I first saw a picture of the 1807 French Napoleonics Carabiniers in a copy of a Funcken uniform book and I always wanted to paint it, but I never got around to it … until now that is. Granted, it is not an entire regiment, but these four guys will run roughshod over many an enemy in a game of Drums and Shakos. Click on any images to enlarge. There are actually a lot of new changes to how I build figures in these models. Although the horses still have a "camel head" look (I need a split egg size between this and the one I use for 25mm horses), I think they look much better using a small thread spool for the neck. 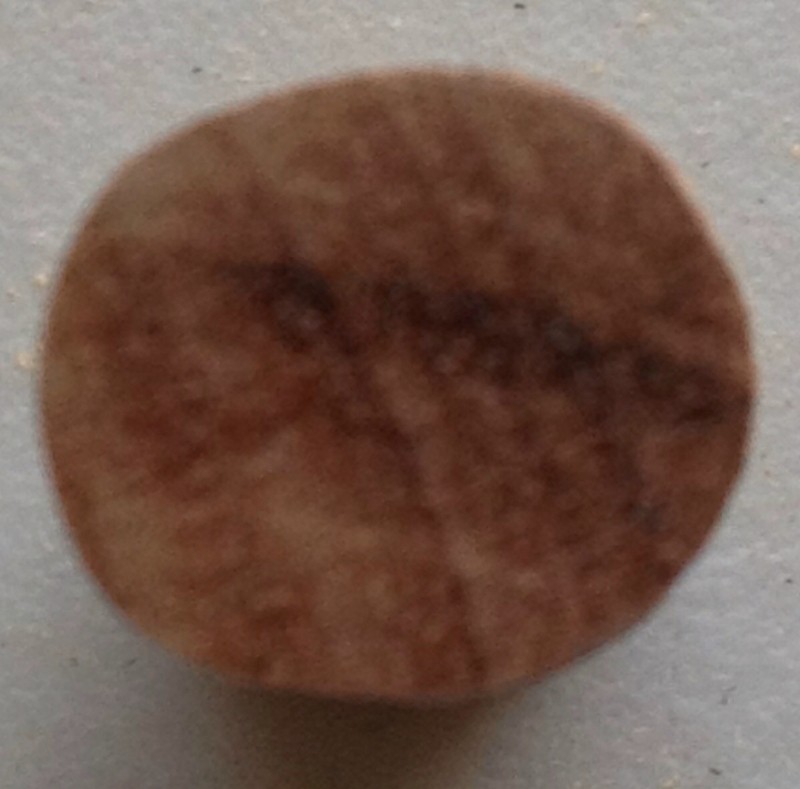 The image below shows the spool in better detail. Also, you can see the new sabers, made entirely from foam. They flex a lot, but they won't break! I had never really been happy with the horses' hair. I had tried modeling material to make a mane, tail, and ears, and they material was hard to control (as it expanded when it dried) and very fragile. I've replaced all of that with foam sheet. 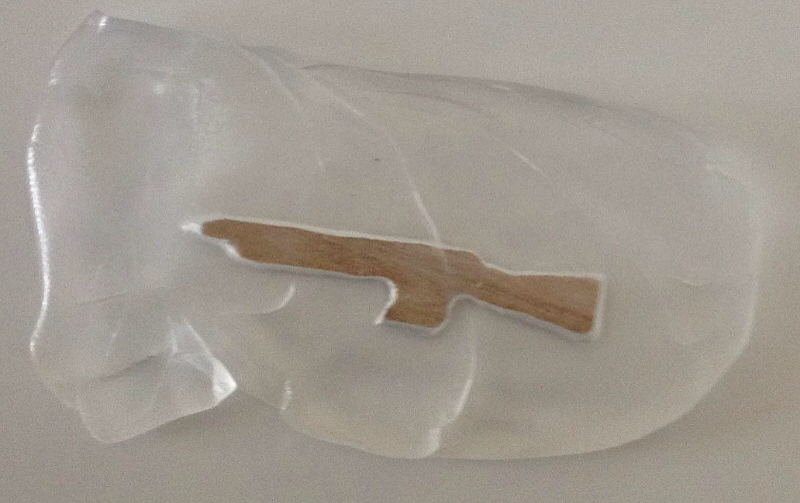 In #1 you can see the tail, cut from a brown piece of foam sheet. 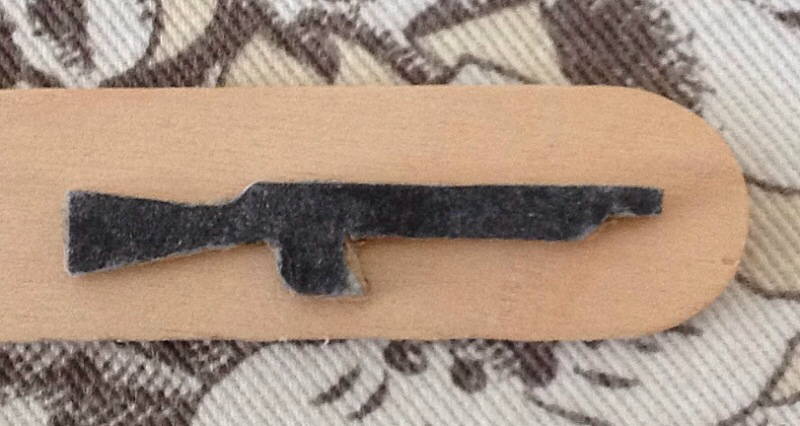 I used alligator teeth scissors to cut the shape, then scrapbooking scissors to "bevel" the edges a bit. #2 was done the same way, except that you can see I made the hair from three separate pieces of foam sheet. By layering two pieces I got a taller mane. In #3 you can see a variation of that mane. Also, you can see that the ears were cut out and simply glued to the back of the split egg. When looking closely at the detail it does look a little strange, but at arms length I think it looks pretty good. 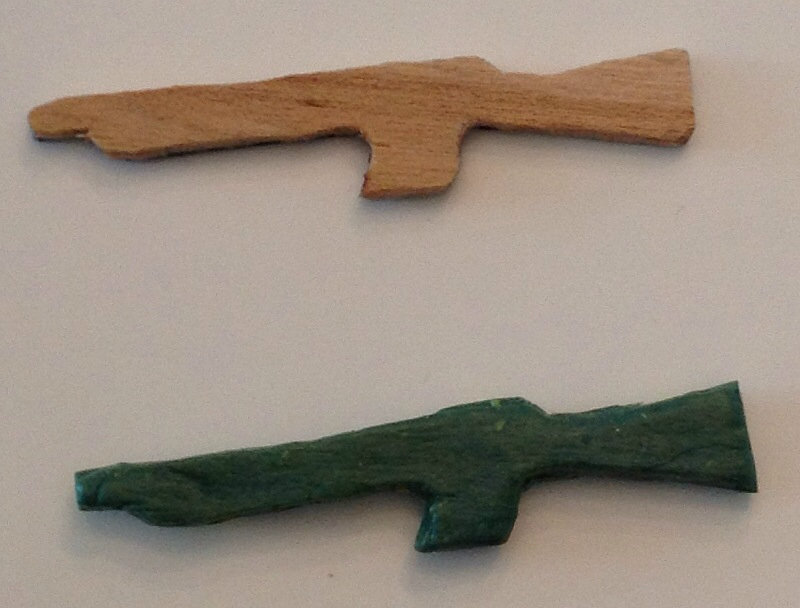 These are the alligator scissors. You can find them in any scrapbooking section of craft stores. There are all sorts of shapes and designs to the teeth. I used these in my Troglodyte experiments. It is interesting that building and painting these figures – especially the more complex uniforms or the cavalry – takes a long time overall, but that is largely because there are a lot of steps and I have a tendency to do several projects all at once (building 20+ figures at a time). In a way you don't really have much interest in the figures at the start. They are simple shapes, and although you can see the potential, they are not really exciting. Then you come back to it, add a bearskin and a plume and get a little more excited. You can start to see it. They you start adding basic paint and get a little more excited. It is when you start reaching the end that you start to see the figure. You want to finish quickly, but for me, I just want to keep adding detail. Finally, it is done and you paint the bases, photograph and then blog them, chomping at the bit to go play a game with them. But, you look over at that table with the other 16+ unfinished figures, and see even more potential just waiting. I hope you enjoy looking at them; I really enjoyed making and painting them to show them off. I finally finished my Dark Ages Warlord. You can click on the images below to get a close-up of the detail. Painting the Sutton Hoo-style visor on the helmet was fun and really adds character to the figure. I experimented a little with adding 'scars' to the shield (that's what those ugly, out-of-place lines are). Next effort will be better, but I am not upset with the results. The lines are just a little too fat. 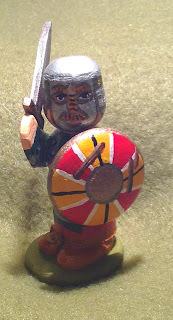 The chainmail turned out fine, but I am still debating whether to add a cloak to the fellow. Not only did I use foam for the arms on this figure, but I made the sword from it too. I have been re-thinking which elements should be foam and which should be wood (or some other material). 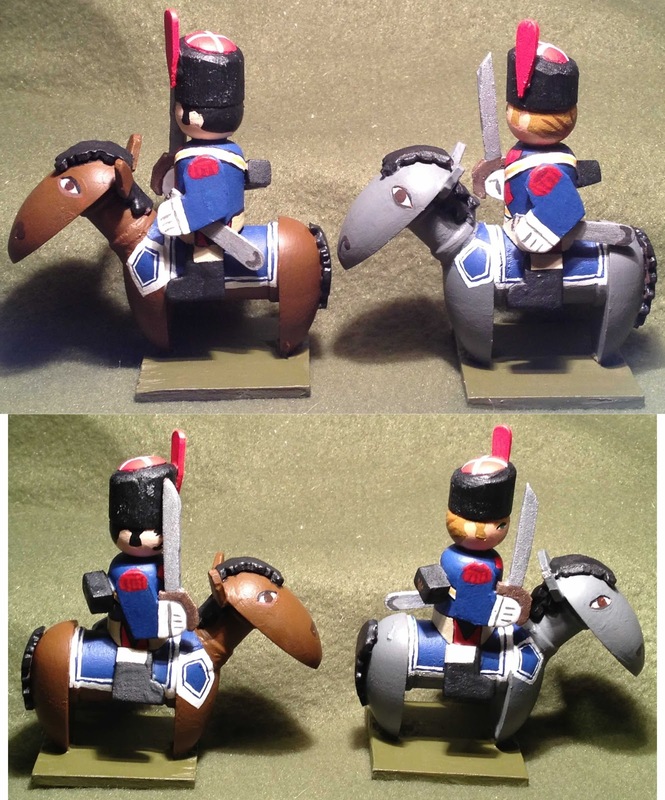 On my upcoming French Napoleonic Carabiniers (1807) you will see some new uses of foam. I am putting the finishing touches on the horse's paint jobs, so it should not be long. But, I will be making their swords from foam too. I decided to try a few foam weapons because of all the "casualties" I have had with my figures so far, it is the wooden swords that have fallen off the most, My theory is that because the wood does not flex, when the figure is accidentally bumped or dropped, all it can do is absorb the impact (i.e. glue holds, but is weakened) or break. The foam will flex, so it should survive. We will see, and I will report on it here. I have already started building my Anglo-Danish army for Saga. I have the basic figure, helmet, feet, and base for eight Hearthguard and eight Warriors. I am still working on the 12 Levy, but they are almost complete (making them, that is; painting still a ways off). As for an opposing army, that is even further off. 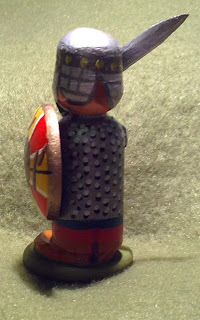 In the Hats, hats, and more hats article, I created a Dark Ages figure (the one with a round shield) and I admit that it looked a little quirky unpainted. 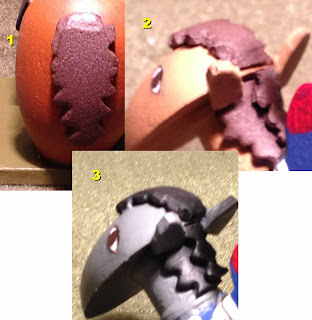 What I was aiming for was something like a 'Sutton Hoo' helmet, as shown in the photos below. The images below show the results painted up. My gilded moustache and lips are a little bigger, but I think the effect is shown pretty well. 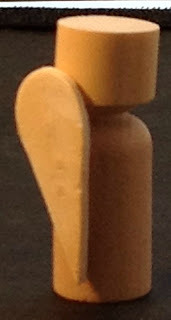 Essentially one cut on a stock figure, one cut on a dowel, a little sanding and putty, and you have a Dark Ages figure. I just need to detail the helmet a little more and finish the body and I will have one fine looking Warlord for Saga and Dux Bellorum. 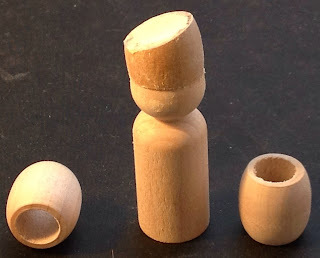 Although I love working with wood, sometimes it is very difficult making small, complex accessories due to their small size and the dangerous, potentially finger removing tools you work with. In those cases, in the past, I have almost always turn to foam sheet and scissors. But even that can be a problem if the accessory's shape is complex enough. For these tasks I turn to a product called Instant Mold and simple press mold castings. I mentioned this product back in Oct 2011. First I created an image of the accessory I want to make (which in this) case is an assault rifle and print it out onto card stock paper. 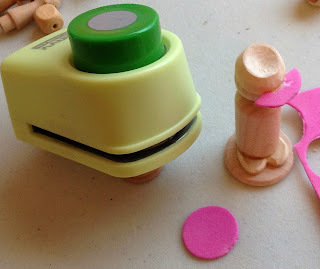 I then carefully cut it out (I have a number of scrapbooking scissors which allow you to make tiny cuts) and glue it to a wood craft stick. 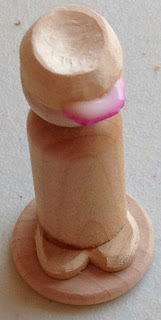 Next, carefully cut out the wood part. 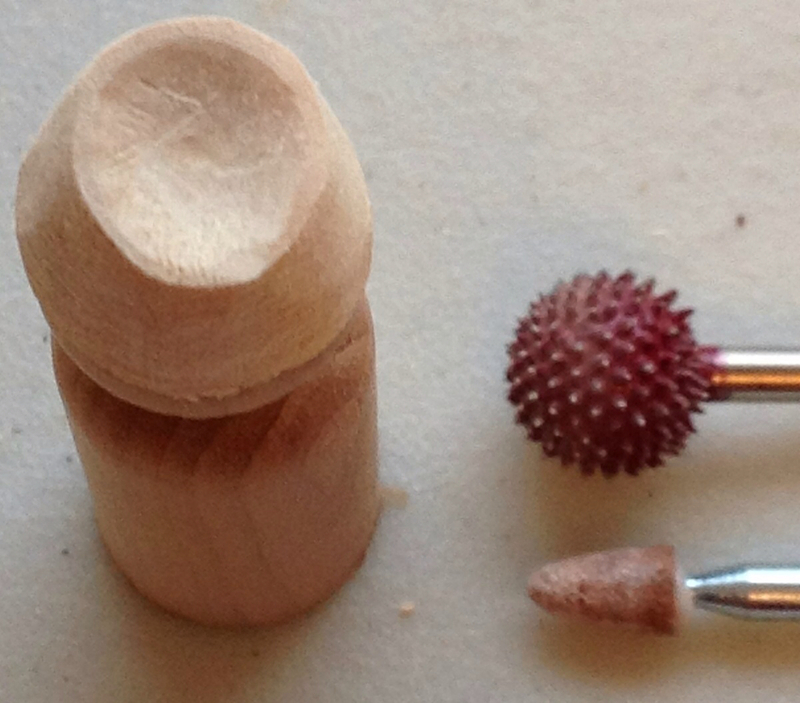 This is when having the saw bit for your Dremel really comes in handy! 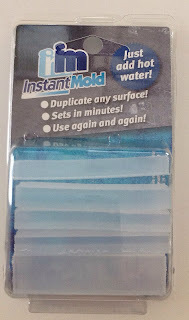 Most tutorials on using Instant Mold recommend using Lego blocks to form a box so that the mold does not flatten out too much. The thinner the mold, the more flexible it will be, and thus the more chance that the casting will be deformed. If you muck it up, don't worry, as all you have to do is drop the blob back into the hot water and try again. In order to set the mold material quickly I dropped the mold and part into ice water. This allowed me to quickly handle the mold without concern that I was deforming it. Once you have a mold to your satisfaction, mix up some two-part ribbon epoxy (otherwise known as Green Stuff) and carefully press it into the mold. In this case you do want the material as thin as possible as any excess on the top will have to be sanded off, so it is not too thick. 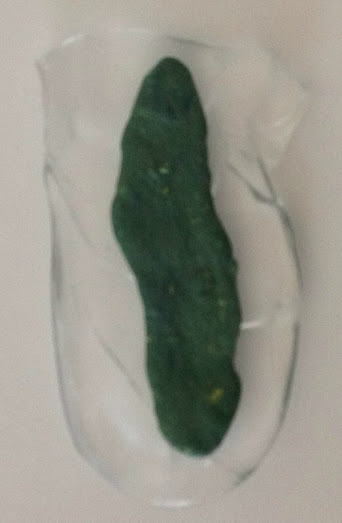 Once the Green Stuff has hardened (about a day, depending upon the quality and age of the epoxy), simply flex the mold and pop the part out. After that, trim the excess Green Stuff off of the part, sand the top side (that was not in the mold), and go ahead and use it. Very easy to make and cast small, complex shapes using this method. 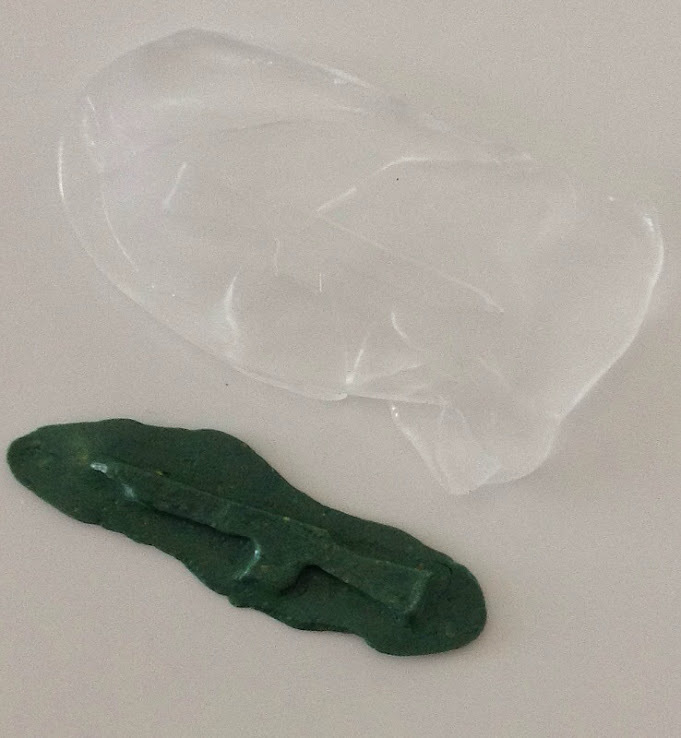 As the mold material is reusable, there is no reason to keep molds around after you are done with them. Simply dump them in the hot water and make a different part. 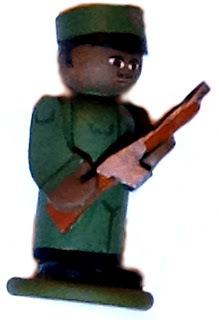 As you can see above, here is one of the assault rifles painted and in the hands of an African soldier featured in the first picture of the last blog entry, for my AK-47 campaign (that I may eventually get to). I hope you found this little tutorial instructive. 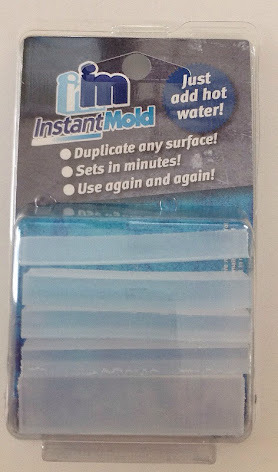 I think you may see more use of Instant Mold by me in the future. As I continue to explore more historical periods to make new figures it occurred to me that largely the defining shape of a model soldier is its' hat. With that idea in mind I decided to explore how to make different hat shapes. I have been thinking about using the Peter Pig's AK-47 rules to run a fictitious campaign in modern (1970's) Africa. 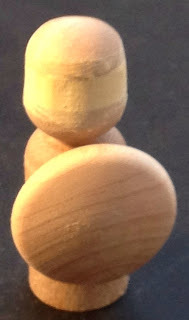 The idea is to make two different hats, one for one side and one for the other, in order to easily distinguish each side. (The base uniform color will also be a distinguishing feature.) The first side will have a field cap that looks a cross between a Marine barracks cover and an old Afrika Korps field cap. As I want the creation of it to be minimalist I have decided that the cap's peak will be painted on rather than made as a separate piece as in my Napoleonic shakos. 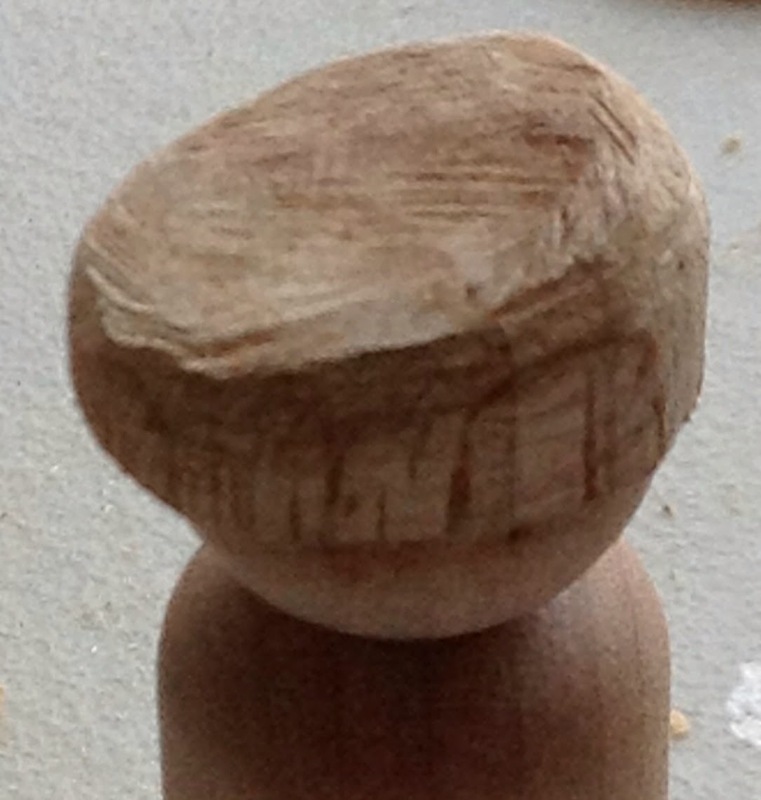 The cap is made by making one straight cut with a miter saw then making the second cut at 15°. By gluing the back edge of the cap as close to the back edge of the figures head, the front of the cap sticks out as a peak would. The other side will wear a beret. This is essentially made the same as the hat above, except you use a dowel one size larger than the diameter of the figure. 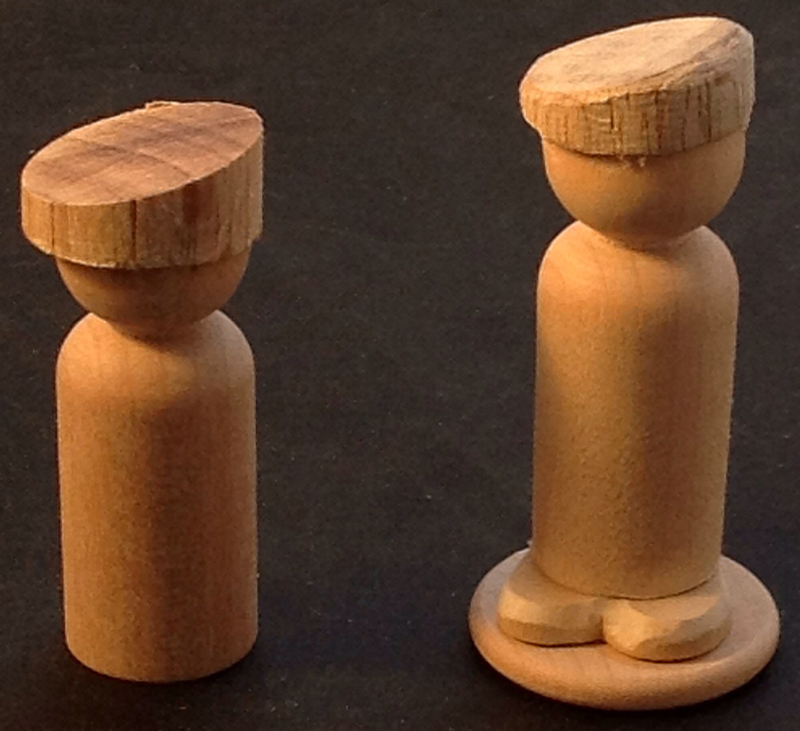 I also cut the piece thinner then I did the hat above. 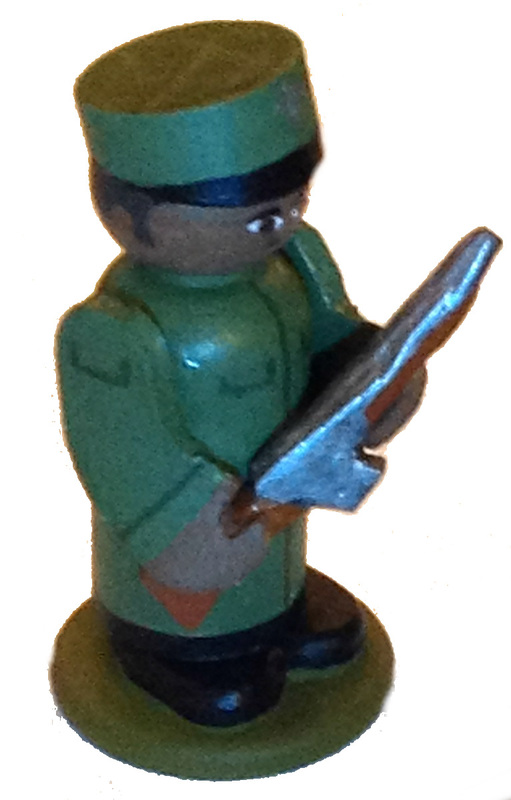 When gluing the beret to the figure the high side is glued to the left side of the figure's head. This makes the low side stick out on the right in an exaggerated fashion. 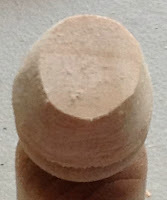 I then use my Dremel sander to shape the beret taking the hard edges off and thinning out the right side as much as possible. 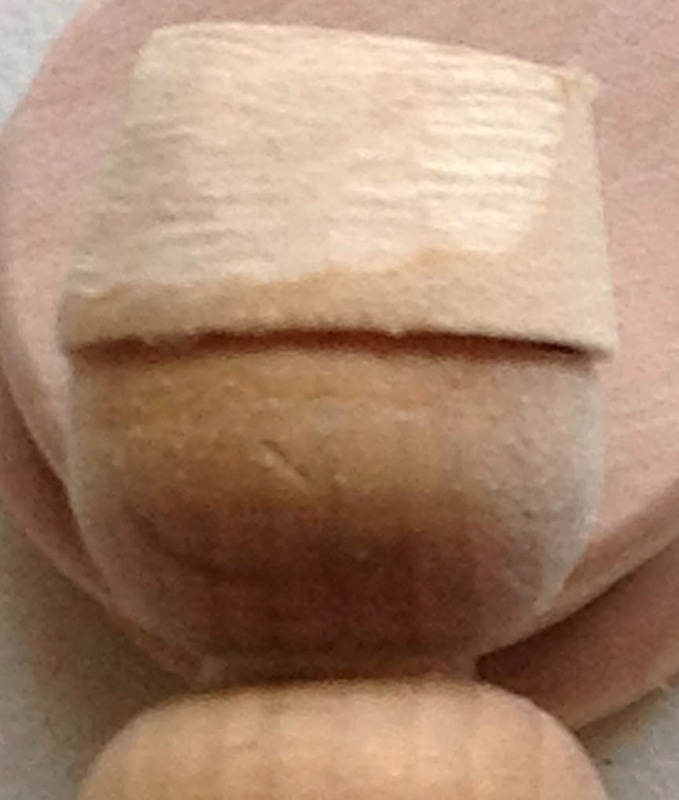 It is also important to rough up the top of the beret, where the cut is made, as this is usually smooth and glossy. Be sure to flatten out the front and back of the beret. It should be oval, not circular. The front and back of the beret should be flush with the head; only the right side should overhang. I use the sander to curve the top of the beret, to round it out. Keep working it until it looks right. Don't worry about it not being consistent. I work with the US Army – where the beret is standard issue now – and they all wear the just a little bit differently. Some "punch them out", some slick them down to follow the curve of their head, and some have them stick out. Then there is the angle that you wear it at. All this variation just makes it more realistic and gives the figures a certain charm. Moving back to the Napoleonic period, I wanted to make an Austrian Grenadier's hat. 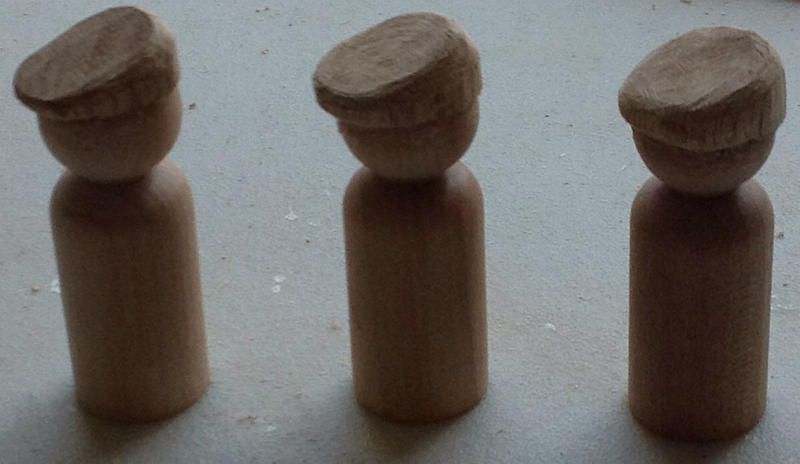 Previously, when I have made Grenadier's hats, I simply used a dowel and cut it appropriately. This is good for a French Old Guard Grenadier's bearskin but less so where the shape needs to be more rounded, or barrel-shaped. 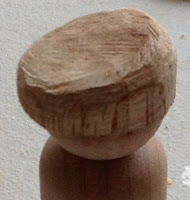 Here I took a barrel bead and cut off the top with a 15° miter saw cut. I then filled the hole with carpenter's wood filler. Later, this will receive a peak, as with a Napoleonic shako. 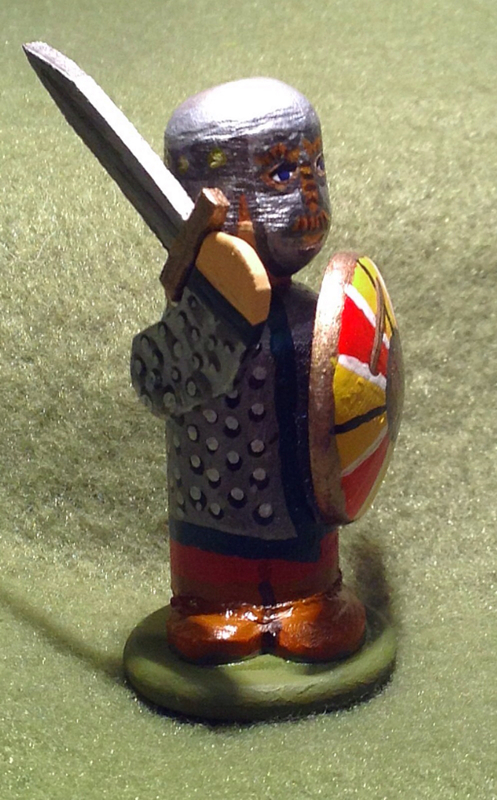 The first wooden soldier project I ever did, as a kid, was to create medieval knights using beads. Here I created a Crusader knight with a barrel helm. 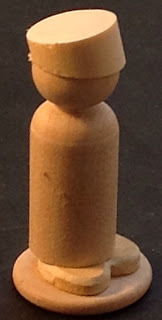 I simply cut a length of dowel and attached it to the figure, which had the majority of the head removed with a miter saw. As the Dark Ages are becoming very popular right now I started exploring ways to represent simple round metal helmets. 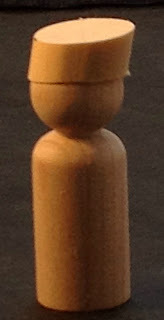 You could simply paint the head of the basic figure as if it had a helmet on it, but it does not look exactly right. Most helmets are slightly taller than the head itself when it is not covered. To achieve the correct effect I simply removed a portion of the head and inserted a thin slice of dowel in between the figure and the top. You can either keep the thin slice as is and paint it as a band on the helmet or you can sand the edges down in order to make it a smoother shape. The figure shows an example where the helmet is smoothed and filled. With the addition of a front and back peak, this is probably the best way to create a picklehaube. I started all of this because I was looking to create a few figures for an ACW skirmish game. Of coarse the most common hat in this period is the kepi. For this I started with the same pattern as the first hat. 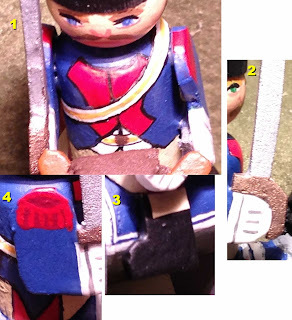 The difference is that I glued the high end flush to the back of the figure's head. I then shaped the hat so that the cylinder of the kepi "falls forward", which was the style worn during the ACW. 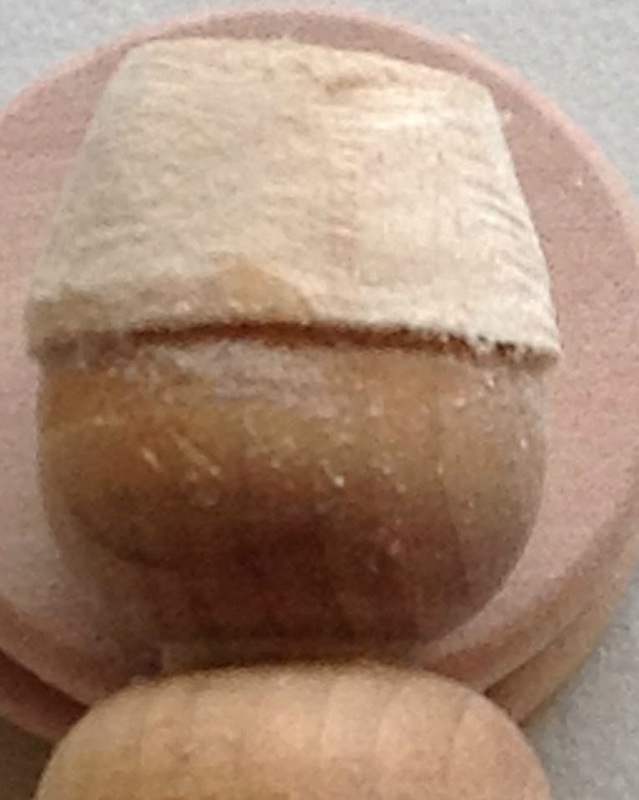 I also sanded a little "dimple" in the top of the kepi to give the crown more definition. The images below show the sequence of creating the kepi; simply sanding with a Dremel. I make the angle sharper on the back than on the front, but as with the beret, historically the kepi was worn in all manner of form. The last image shows the method of adding the dimple. I use a round burr bit to remove most of the material, then follow up with a much smaller sanding bit to smooth out the roughness. Shape the Back Shape the Front Ensure Top is Even Add the "Dimple"
An interesting variation of the kepi is to make two parallel 15° cuts with the miter saw so that the front and back of the hat is sloped forward. This shape is very similar to a German police officer's cap in the late 19th century and is also reminiscent of a German Jager shako in the Franco-Prussian War. The last figure is a Zouave in turban (or a Sikh, or any number of Asians that wear turbans). 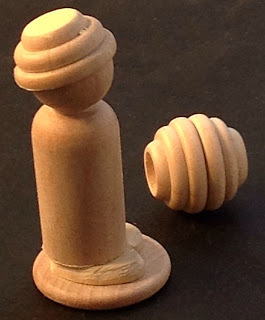 This requires you get a "beehive" bead and carefully cut it in half. To make the turban look a little better, you need to cut the top of the figure's head at a 15° angle so the turban is high on the forehead and low on the back of the neck. For Indian turbans, like Bengal lancers, you can add a foam rectangle to the back to represent the end hanging down. Well, I hope you have found this instructive. My next project is to show how to make small accessories that are hard or tedious to duplicate in wood, such as an assault rifle (to go with my beret-wearing African troops). Copyright © Dale Hurtt. Simple theme. Powered by Blogger.